One of the things that the girls are most into at the moment is role playing with their toys. Acting out scenarios and everything they touch are turned into big talkers. Trains, cars, animals, dinosaurs, fluffy rabbits, cutlery and this morning gingerbread people (Wholefoods is rather PC on that front). It’s lovely to watch them play together. There is this unspoken bond where they phase in and out of playing together without it being a big deal. This twin thing of having a built in playmate is aces. Of course they still don’t see themselves as “twins” which is a-okay but when pressed they will admit to being twinned with us, Daddy is Nomi’s twin and I am Zoey’s obviously. 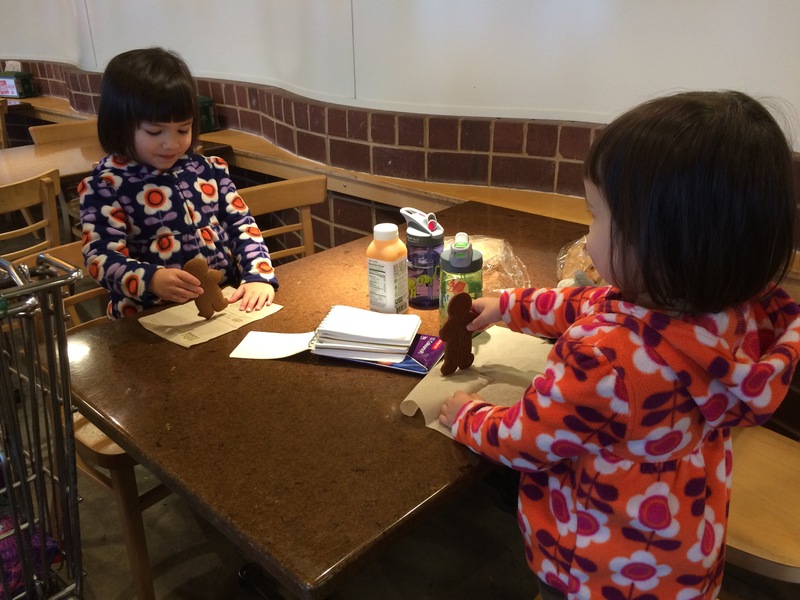 Such a fantastic age – gingerbread friends AND a sweet snack!